One question that comes with the development of news as more of a social experience is the degree to which people are more likely to get news that conforms to their views. The data here offer some first insights but also suggest there is room for more research. Facebook news consumers are on par with U.S. adults overall in saying they prefer news that does not have a point of view over news that shares their own view. More than two-thirds, 68%, of Facebook news consumers say they prefer news that does not have a point of view, nearly identical to the 71% of the general population that says this. Still, Facebook news consumers who find the site an important way to get news show a greater predilection to getting news they agree with. This group is more likely than those who say it is not important to prefer news with their point of view (38% of those who say it is important versus 26% of those who say it is not). Those with a political party affiliation also are more likely to say they prefer news that shares their own point of view. Among U.S. adults overall, about a third of Republicans (33%) and Democrats (30%) like news this way, compared with 19% of independents. 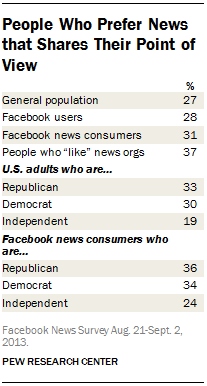 That pattern also is true among Facebook news consumers; among this group, 36% of Republicans, 34% of Democrats and just 24% of independents say they like news that mostly shares their own point of view. Still, more than half of Facebook news consumers, 58%, have been surprised by a friend’s or family member’s views – suggesting that at least to some degree Facebook has helped people get to know where their friends stand on different issues.